Tension in the muscles can be a common complaint for many women, especially as they approach menopause. The most frequent cause of muscle tension during menopause is unbalanced hormone levels. Fortunately, there are things you can do to ease the pain and burning feelings brought on by muscle tension. 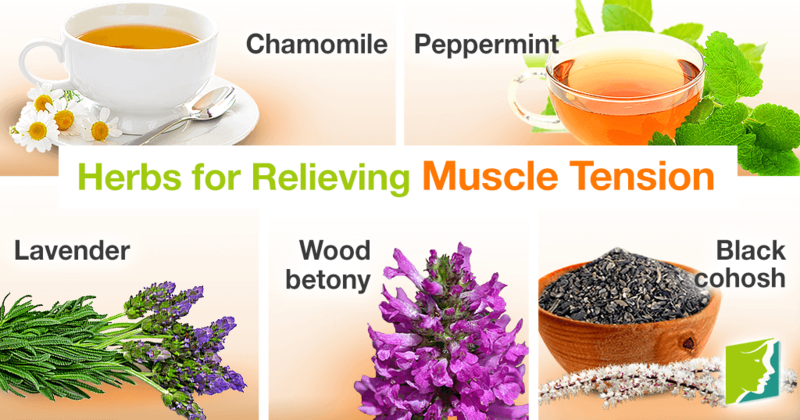 Certain herbs may work to relax muscles and prevent muscle soreness. Keep reading to discover five herbs that may provide tense muscles with relief. Chamomile is one of the oldest medicines known to mankind, and has been shown to soothe and cure several different ailments, including muscle spasms and inflammation. Chamomile is most commonly brewed into an infusion or tea, of which more than one million cups are drank each day. Peppermint is suited for decreasing muscle tension because it contains both menthol and camphor. These two compounds can help ease muscle tightness. Peppermint has been shown to relieve tension headaches and aid indigestion by soothing stomach muscles, ailments menopausal women frequently suffer from. Because of its benefits for digestion, peppermint is often taken after meals, but its benefits work well no matter when it is taken. Peppermint can be drank in tea, taken in supplements, or applied to skin as a cream. Lavender is best known for its beautiful and distinct fragrance, but it's also used as an herbal supplement that has traditionally been used to cure insomnia and restlessness. Studies have shown that massages with the essential oil of lavender and aromatherapy with lavender do work to improve sleep quality and reduce anxiety. Lavender may be able to help your tense muscles if they are being caused by restlessness or anxiety. Wood betony is used by some to treat anxiety and as an anti-inflammatory. These properties may make wood betony useful in treating muscle tension. This herb has been touted since Ancient Rome as a remedy for several different conditions, but there is little scientific evidence that corroborates wood betony's properties against anxiety or mood disorders. A relatively recent Russian study, however, has found that it contains glycosides, which may reduce blood pressure and muscle tension. This herb is available both as an ointment - for localized massages - and as an herbal tea. Black cohosh, a phytoestrogenic herb, helps to relax muscle tension as well as working to relieve other symptoms you might experience during menopause. Scientific studies have corroborated its use, although it is not recommended to use it for more than six months. It can be hard coping with the pain caused by tense muscles on top of a range of other menopausal symptoms. But these five herbs will provide you with relief from muscle tension. Read on to learn more about reducing menopause symptoms like muscle tension. Find out about three hidden causes of leg pain people might not know and learn about the associated symptoms. Can Tai Chi Help Ease Muscle Tension during Menopause? Tai Chi is an ancient martial art form that can be extremely beneficial for sufferers of chronic pain and muscle tension. Muscle tension is often caused by stress and commonly afflicts menopausal women. However, there are many strategies to reduce muscle tension.